Hi, I'm pretty new to both Gimp and Linux. But I cannot get Gimp to recognize them as two different fonts, or to name them correctly. First off, they pop up in the Gimp font list with wrong names. Both have been labelled as 'Omnes Light' - which is in fact the name of a different font - that I haven't installed. And when I use them to edit text, both fonts print out identically - which is wrong, they should appear notably different from each other.. 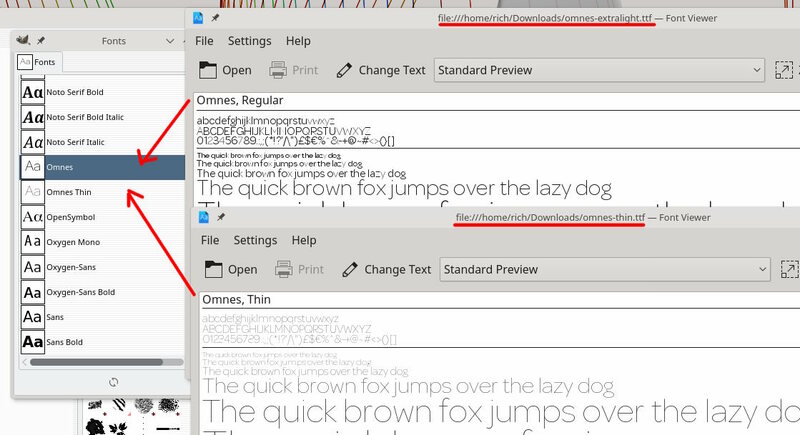 I have installed .otf versions of both fonts with the same result. 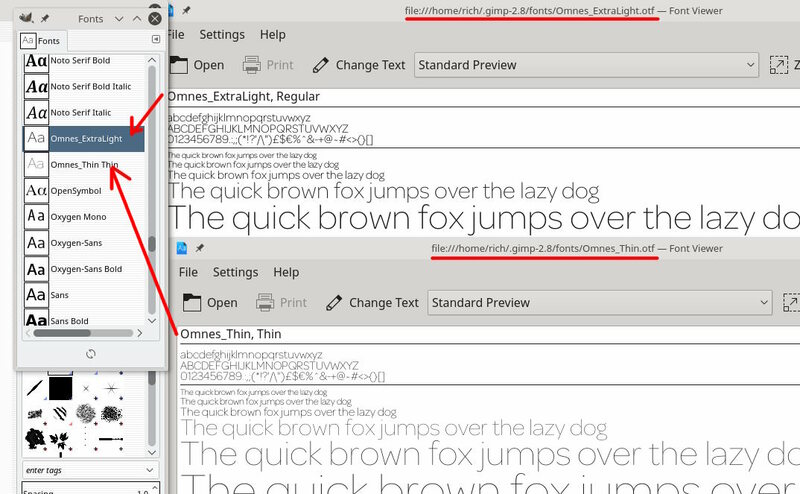 I have tried installing the fonts automatically via Font viewer. None of the above work. I'd appreciate any help anyone can offer ! I think I found those fonts. For a proper solution, you should contact the author for clarification. They probably show up correctly in an application where just the font family shows and a drop down menu to select a class. Attached the two files as otf (zipped) so no confusing with your existing ttf files. I am no expert with fonts/fontforge, it is about the best I can do. Thanks Rich2005 ! I'm enormously grateful for your help. I dropped in your new fonts and they worked immediately. There's no way I would have been able to figure that out for myself, so I would probably have branded myself as an idiot and abandoned the project ! I may have to 're-engineer' more fonts in this same family in order to complete the project. But At least with your help I now have some idea how to set about doing it. Many thanks again for your time !